Article reposted with permission from Bell on Heels. I didn’t grow up going to the zoo. As a matter of fact, I think the one and only time that I went was on a school field trip. I only have very vague memories of the trip. Unless the trip was actually a dream. I can’t be sure. I was a kid. 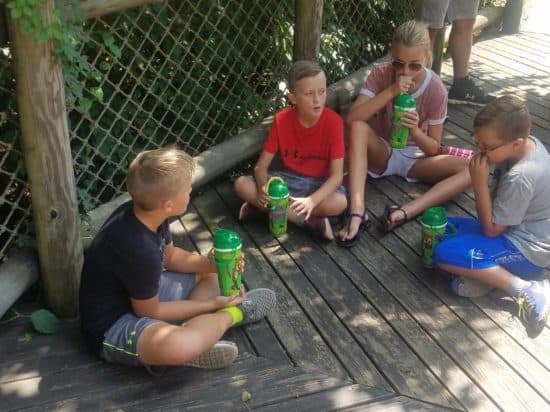 I thought about asking my mother if I actually went to the zoo but you know as well as I do, back then our parents had no clue what we did every day. Especially at school. 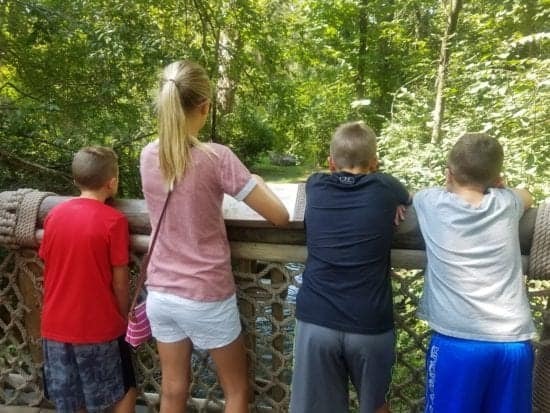 Yesterday we decided to take our kids to the zoo. A chance to be one with nature. To see the animals in their natural environment. Or rather the environment man built for them before they hauled them here from Africa. I don’t know exactly how the animals feel about living there. At least no other animals are chasing them trying to eat them while they are safely behind their fences and retaining walls. Well, except for that frog that was in the snake’s tank. He was screwed. 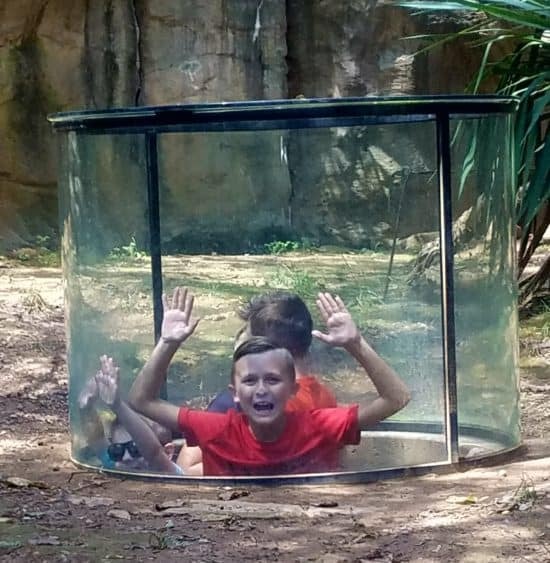 I wanted my kids to enjoy a zoo experience. Or maybe I just wanted to ruin their Labor Day weekend. Either way off we went. 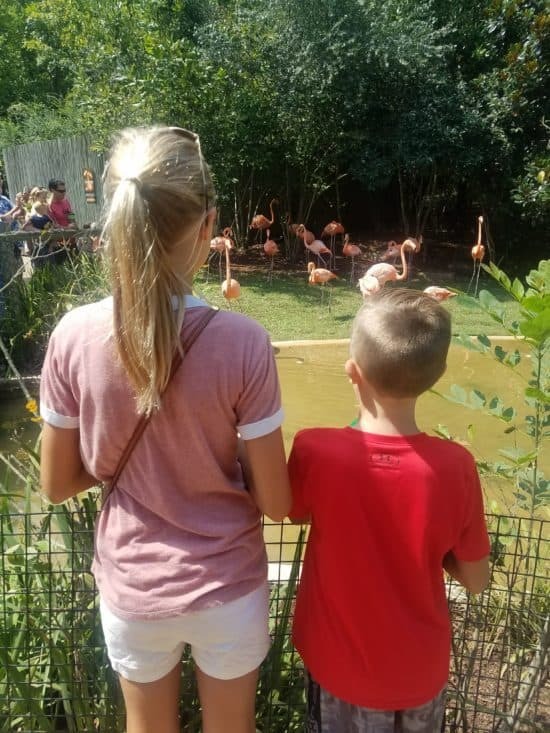 Luckily, we live close to the Nashville zoo. Not too long of a drive. The thing about car rides with my children though is they are very spirited and loud. Yes, I will accept responsibility for that fact, as I am often spirited and loud myself. But also there are four of them. I try to turn the music up loudly but they just talk over it, like it’s their job. Glad my husband was driving yesterday because I was the chaos coordinator. Because my kids don’t just chit-chat. They also bicker, call one another names and occasionally engage in physical altercations, with each other. We pulled up to the zoo and parked, then began the trek to the ticket office. Naturally there was a line. And naturally it was 88 degrees. Because I KNOW how to pick zoo days. The line actually moved fairly quickly. 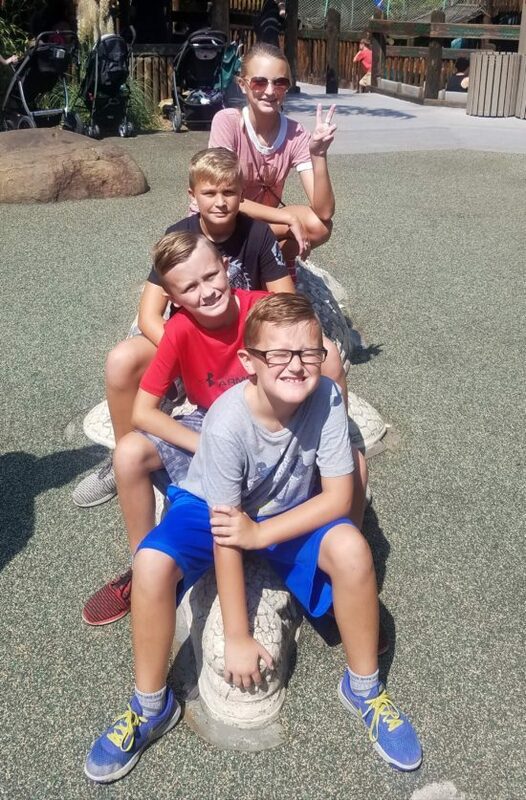 Taking four kids to do anything isn’t cheap. I forked over my credit card because, well, zoo. Before we even got in the gates good, my kids were begging for water and souvenirs. I admit as a mom, I come from a place of NO. My initial answer is usually no. But honestly NO just gives me time to make up my mind. I can always change my reply to yes later. We started on the side of the zoo that gets the full sun. You know, where the rhinos and giraffes recreate living in an African savanna. I thought this was a good idea. Get the hottest part over with while we were still feeling unworn. After a few exhibits, we came to a gigantic kid’s play area. Plenty of things to climb and play on, all while getting super hot and extra tired. Dad and I took a seat on a bench in the shade and let them run wild, in the zero entry play place. In thirty minute or so they all returned to let us know they were exhausted and parched. Now, we aren’t your professional zoo types. We saw people with wagons, lunches and water jugs. But not us. I just had my trusty credit card. Again we had to stand in line. My children needed water. Looking at the price list, we saw that a bottle of water was three dollars. Which is a ridiculous price and you would think that we would learn to pack water. Upon closer observation I noticed that they had a refillable souvenir cup for only seven dollars. Free refills all day. They even came with bendy straws and carrying handles. They seemed like the better value since we could fill it, again and again, for one outrageous price. I ordered six. 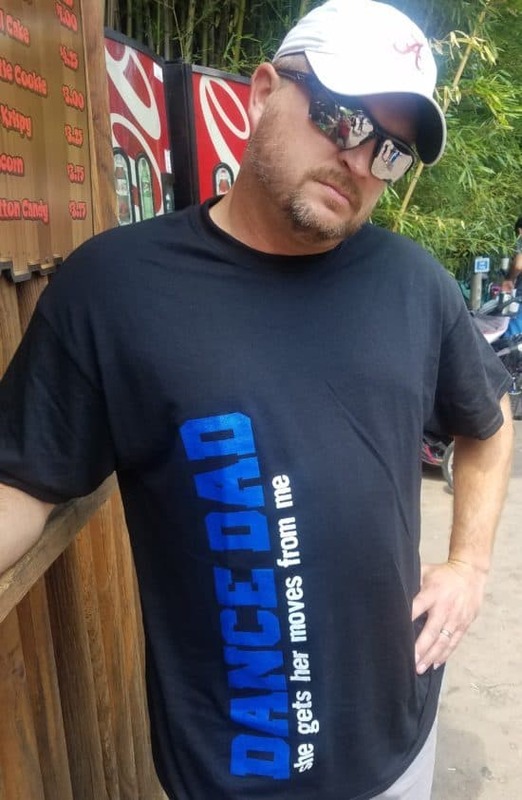 My husband stood and glared at me like this. My kids thought for sure I would come back with regular bottled waters. Look at those thrilled faces. Actually this is where I had to demand that they get up from the table and keep moving. 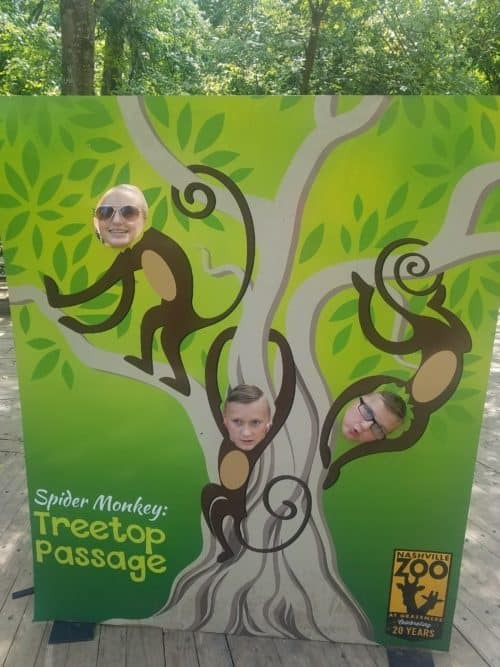 By this point they were already tired and ready to leave the zoo. I forced them into more fun though, against their will. I told them we were absolutely not leaving until we had 81 dollars worth of fun. Which just so happened to be the price of our admission. Of course we also had to wait in line again for refills because the 42 dollars I had spent on water was in vain otherwise. 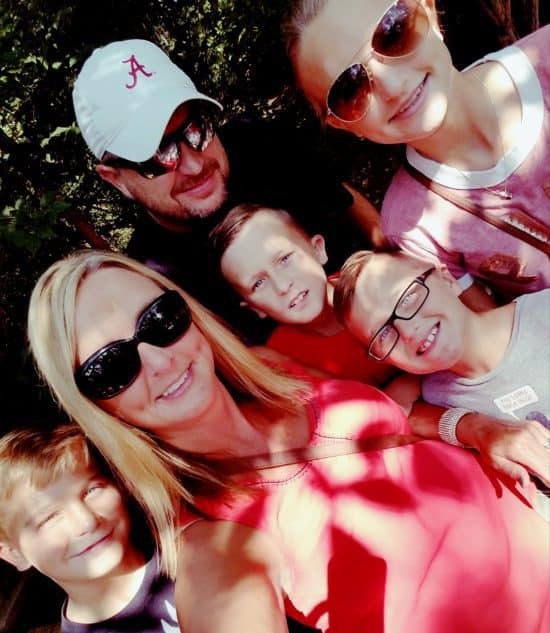 By the time we made it through the entire zoo, and I mean we looked at every single exhibit in there, everyone was over it. Even Dad was grumpy and ready to pull the plug. 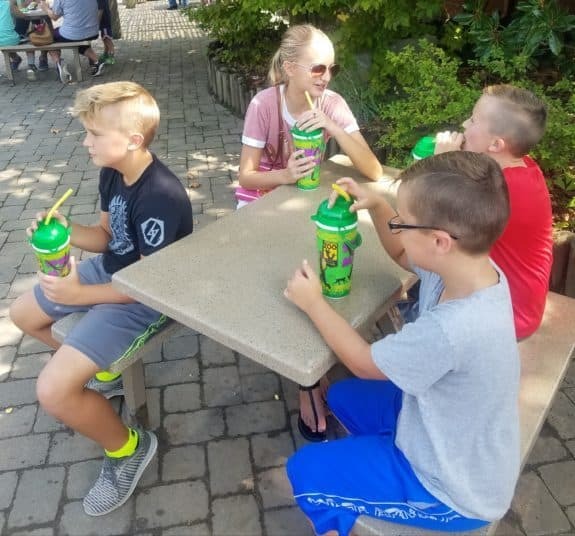 Feeling victorious at having an educational family zoo day, six people, carrying six expensive, refillable cups (because we get five dollar refills if we bring them back!) (Dad said we are never going back.) loaded into the vehicle and drove away. As we enjoyed an air-conditioned meal at a lovely BBQ joint, my kids began to discuss all of their favorite things about the day. It would seem that despite all of their grumbling, they actually had a great time. Creating family memories is worth every dollar and every sweat bead that we dripped. I cannot wait to make more memories, even if it is against their will. We’d like to thank Bell on Heels for being our Guest Blogger! Check out her blog for more adventures!